Pho the Photon is the star of a student-made animated short film about NASA's upcoming ICESat-2 mission. 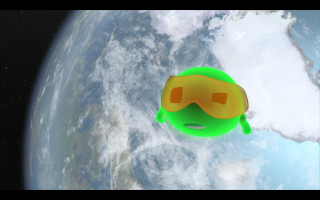 A new animated movie created by student filmmakers shows the journey of an adorable little photon who is sent on a long journey as part of a NASA science mission. The star of the new animated short is Pho the Photon, a particle of light who wears goggles and propels himself forward by moving his arms in a swimming motion. Real photons don't have eyes or arms, of course, but the film does capture some of the real science behind NASA's upcoming Ice, Cloud, and Land Elevation Satellite-2, or ICESat-2, mission. ICESat-2, scheduled to launch in 2018, will use laser light to measure the elevation of Earth's surface, with a focus on regions like Greenland and Antarctica, where snow and ice levels are changing, according to a statement from NASA. The outreach project began with a course at the school's Collaborative Learning Center. Enrolled students heard presentations from ICESat-2 scientists, and some students later visited NASA's Goddard Space Flight Center to learn more about the mission. A few selected projects moved on to development, which included pitching the ideas toICESat-2 scientists and making changes based on feedback. "Once the students developed and pitched ideas during the course, several went on to customized paid internships with the ICESat-2 project to bring selected products to life," according to the statement from NASA. "Working with the students was a fantastic experience," Thorsten Markus, ICESat-2 project scientist, said in the statement. Markus originally proposed the idea to involve art students in an outreach project. "I was stunned by their interest in the scientific as well as technological details, by their ability to quickly grasp the major concepts, and, obviously, by their creative thinking." The movie debuted at the Polar Science Weekend at the Pacific Science Center in Seattle, and will play at several science museums.